This is a message, I first preached, over 10 years ago. I have edited it some, to make it easier to read, but it’s truths have never changed! They are eternal! I have changed, and my understanding of these things has deepened, as I have grown in character and the fruit of the spirit, yet I am still a faith preacher, and God is still only pleased, by faith! 1 Cor 13:4 Love is patient; love is kind. Love isn’t envious, doesn’t boast, brag, or strut about. There’s no arrogance in love; 5 it’s never rude, crude, or indecent—it’s not self-absorbed. Love isn’t easily upset. Love doesn’t tally wrongs 6 or celebrate injustice; but truth—yes, truth—is love’s delight! 7 Love puts up with anything and everything that comes along; it trusts, hopes, and endures no matter what. 8 Love will never become obsolete. 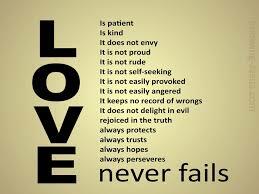 In one version, verse 8 reads: Love never fails. If you determine to walk in love, no matter what, you won’t ever fail either. 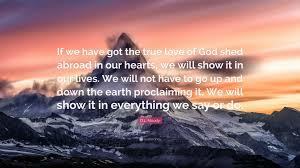 If you have true faith in God, you will be full of love, for God is love, and whenever we authentically meet with Him, He meets with us, and fills us with His love, so that His love is shed abroad in our hearts by the Holy Spirit. If you think about it, Jesus commanded us to feed the hungry, clothe the naked, preach the gospel, visit the sick and the prisoner, and overcome evil with good. 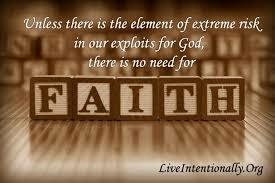 These actions of our faith, are only possible from a living vital relationship with an Almighty loving God! 1. Established and walking in the love of God. 3. Calling those things that be not as though they are. 4. Speaking to your mountain! Let’s look at our decision to commit to doing the Will of God. Now most of us who have been on here know that I am committed to the Lordship of Jesus Christ. In previous lessons and blogs, we have looked at the concept of Lordship. That is, if Jesus is our Lord, we need to do what He says. It is clearly established from the Word of God, that we need to seek Him first. 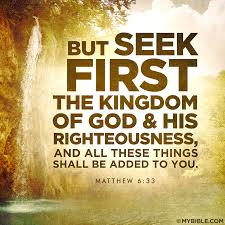 How you meet with Jesus, first thing in the morning, may differ for each person, but seek, is an action word, and whether you are a prayer, praiser, or studier, we all need to seek Him first, every day. 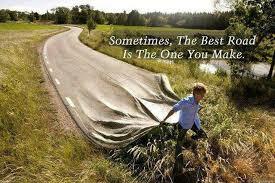 Like the Nike ad, as far as putting God first goes in your life ‘Just Do it!”. Establish your morning watch. Take that time, and put it into praise and worship, prayer, reading your Bible or listening to it on cassette, or simply changing the station and watching some good solid Bible teachers, or other fine television ministries instead of the sit-coms and soaps, and watch your life change! Yet, I am a faith preacher, and we are going to get back over to looking at faith here in a couple of minutes. Yet, I need to make sure ‘seek ye first’ is working in your life, or you are not in position to have all these other things added unto you. Now, many of us are determined to live for Jesus, and to walk with Him every day. Before I preach faith to you, I need to talk about commitment. 2. To entrust for safe keeping. Today I need to preach for a commitment. Many of us take Jesus as our Saviour, but how many of us are committed to making Him Lord of our lives? You see the first definition of commitment is to do, to perform. We need to do what He says, both in the written Word, and in the hearing of the Holy Spirit. Helen Keller, you remember, the lady who lived her life blind and deaf, said this: “I am only one; but still I am one. I cannot do everything, but still I can do something. I will not refuse to do the something I can do. I get really frustrated with people who refuse to move on in their lives. Why? I remember visiting CHEO (The Children’s Hospital of Eastern Ontario) and seeing the receptionist there, who was a quadriplegic, answering the telephone with his headset, and operating his computer with a mouth stick. He was cheerful and happy, and doing a great job. Yet, I see people that can walk, see, talk and learn, yet who refuse to invest their lives in anything, and it ticks me off. 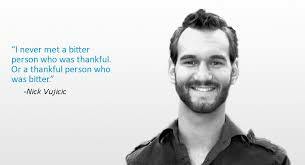 Look at Nick Vujicic, if you want to see what a man with no arms and no legs can do! He is a husband, father, adventurer, and incredibly gifted public speaker. Self Pity is from hell! Why? Because it mocks God’s power. It says that the God we serve is not big enough to help us move beyond our own little world. It is blasphemy in light of what Jesus died to provide for us. The second, is easy, we have entrusted Jesus Christ, the Son of God, to save us, and to take us eternally to heaven to live with Him. Now I lay me down to sleep, I pray the Lord my soul to keep. More than a children’s bedtime prayer, it’s our eternal security. Yet, before I preach here a bit, I need to talk about our pledge, our obligation. You see if we decide to commit to the Lord, we make a solemn pledge to live for Him. We bind ourselves to the plan of God, determined to die if necessary rather than fail in it. I desire that you might KNOW the will of God, and understand it. I pray that you DO the will of God. I pray you INCREASE in the knowledge of God. 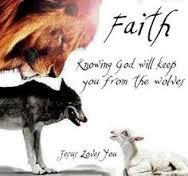 I pray God grant you STRENGTH, to endure joyfully all the challenges this world throws at you. Many of us have been tossed to and fro by every wind of the Media, and teaching that comes across our path. I heard a minister say it this way. If you have received a promise of God, and you are determined to believe it, stand upon it, unto death if necessary, you won’t be standing very long. There needs to be in the heart of every Christian the willingness to die rather than compromise the Word of God. 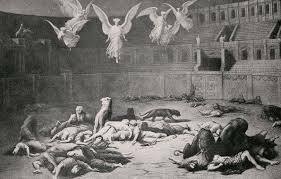 If you want to read a few stories along this line, pick up a copy of ‘Foxes book of Martyrs, many have paid the ultimate price for our faith. Freedom is not free, and I am prepared to live for Jesus, beyond death if necessary: you cannot threaten a true Christian with heaven! Yet, I’m not going to die, for it is written: ‘With long life, will He satisfy thee!’ I will live and not die, and declare the glory of God! Seems, as a warrior, I am more use to Him, here, in the earth, than up in heaven! This type of commitment to truth, will cause true Bible faith to produce anything you need in this life. 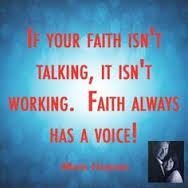 Faith has a voice. Let the redeemed of the Lord say so! 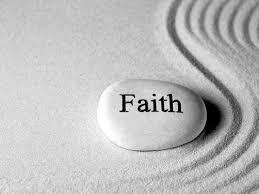 Notice here, that as we abound in faith, we also abound in utterance, because again we see, that faith has a voice! Certain things belong to us from the Word of God. Some of these include: healing, direction, comfort, provision, wisdom, supernatural favor from heaven with people, protection, encouragement, and deliverance. How I wish these things were automatic if you simply followed Jesus! Some of them are, but most require violent faith to actually appropriate and receive. If you want to receive healing, you need to know that Jesus took stripes in His body that your body be healed. You need to know how to hear the voice of the Holy Spirit, how to recognize the inward witness He provides, how to recognize the peace of God leading you in your heart. I wrote a seven part teaching entitled ‘Knowing Your Future’ in my book, ‘The Parable of the Sower’. If you are lonely or discouraged, and you need the comfort and strength of the living Holy Spirit, then call to your remembrance: Hebrews 13:5 Let your conversation be without covetousness; and be content with such things as ye have: for he hath said, I will never leave thee, nor forsake thee. A little faith will get you a little provision, yet if you are going to prosper in God financially, you are going to have to tithe, give offerings, exercise stewardship, and then use your faith to work and aggressively to reap. 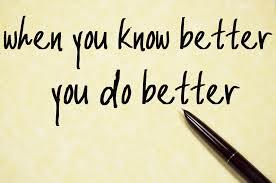 Don’t know how to do something? Ask God. He will give you supernatural wisdom. Don’t know how to deal with a person, who is not a Christian? 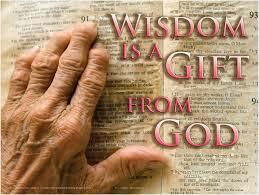 God couldn’t ask you to walk in wisdom towards sinners, if He did not provide that wisdom you need for you. How about favor? There is supernatural favor to be received from heaven, simply by asking for it. Esther fasted and prayed, and asked God for favor from the king. God gave it to her. 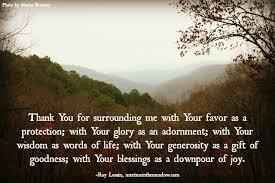 Nehemiah prayed as asked God for favor with the king. God gave it. Like Jesus, God expects you to Luke 2:52 increase in wisdom and stature, and in favor with God and man. Psalms 5:12 (Douay) (5-13) For thou wilt bless the just. O Lord, thou hast crowned us, as with a shield of thy good will. Because you have been made righteous in God’s sight, you have the right to ask Him for supernatural favor with people. Glory! See if that doesn’t help your business and family life! Deliverance: Ps 91: 14 Because he hath set his love upon me, therefore will I deliver him: I will set him on high, because he hath known my name. When the day of trouble comes to your life, if you serve God. He will deliver you! Now, these are things we need to be in faith about, every day. Deliberately pleading and possessing the promises of God, before His throne. We need to press into God for them. These are things that if they are not happening, need to happen, and they will if you believe and obey God. Each day, I call for these things into my life, whether I feel like it or not. I believe God’s Word on purpose. So should you. This is how we call those things that be not, as though they are. These things have been freely given to us, but they must be received, by faith. Notice here, that the shield of faith does us no good, unless we actually take it! 4. Now, let’s talk about mountains. Jesus: 22 Trust in God. 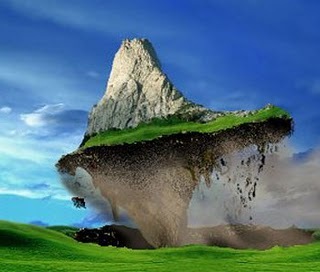 23 If you do, honestly, you can say to this mountain, “Mountain, uproot yourself and throw yourself into the sea.” If you don’t doubt, but trust that what you say will take place, then it will happen. 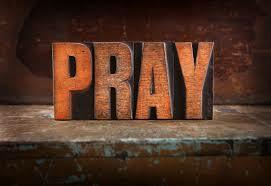 24 So listen to what I’m saying: Whatever you pray for or ask from God, believe that you’ll receive it and you will. Remember, faith has a voice. You need to discover what are the roadblocks in your life, and then call them what they are, mountains. You need to command them to move. Your mountain needs to hear your voice. Your voice is your address in the realm of the Spirit, it is the place God delivers your personal blessing to. Do you have problems in your life that never have seemed to go away? They do not mean that you are not a royal heir, a child of the king, and that you are out of the will of God. Satan is still alive, and not in hell yet (tick, tick, but his time is running out!) and whether you like it or not, he is opposing the plan of God in your life. He sets up roadblocks that only the power of God can move, but hear this. If you do not speak to them, they will not move. Well let me tell you something about mountains. I have my CIL blasting ticket, that I took as part of my commercial diving training. Ever seen a road crew build a road? “Ever watched a road crew remove a mountain so they can put in a road? It’s a big job. It doesn’t happen overnight. Sometimes it takes days and weeks to bring that mountain down to size. I remember as a child, traveling with dad back and forth to California holding meetings. I remember seeing those road construction crews out there blasting their way through the sides of mountains. 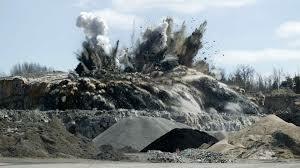 They literally blew up a mountain, piece by piece. All the traffic was stopped on that stretch of the road, and we had to turn off our radios and two-way equipment because the road crew was getting ready to blast. They’d drilled into the mountainside, and now they were getting ready to set off the charges. Once they pushed the button on that detonator, you could see rocks flying everywhere. It looked like a volcano going off. Some of the small fragments even came sailing down on top of the cars, that were parked quite a distance from the mountain. Then the workman would go back to the mountain site, clean up the rocks and debris, start drilling again, and pack the mountain with dynamite again. Then they would set off another blast, and it would cause the mountain to crumble some more. 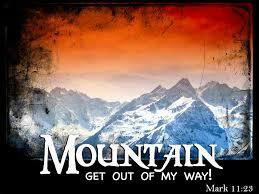 That’s the way it is in the spiritual realm when you start quoting God’s Word against the mountains in your life. When you quote God’s Word in faith, and authority, you are setting off the detonator of a powerful blast of God’s power that is demolishing your mountain, piece by piece. That’s why you can’t give up after quoting a few Scriptures one time. 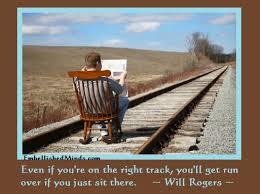 As you faithfully quote the Word, give the Word time to work on your problem. Many times these mountains in your life are not going to leave, overnight. Some of them took years to develop, and are bigger than you think. Ever seen a ship, a tanker go by? It’s moving, but it is so big that it takes a long time to pass from view. Yet, if you keep your confidence in God’s Word, and diligently quote it over your problems, they will leave. ‘Heavenly Father, I thank you that your Word declares that I have the authority to speak to the mountains in my life. Therefore I exercise my rights and privileges according to Mark 11:23. Now, I am not going to pretend that I am the Holy Spirit. As He shows you what the obstacles are in your life, give them a name, and command them, in violent faith, to MOVE, in the name and authority of the Lord Jesus Christ! Jesus fights for truth – in this land of freedom, liberty and justice for all!Be Diligent in YOUR Work! 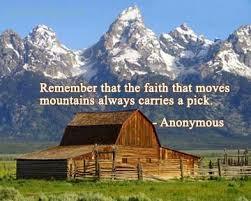 Just heard a sermon last Sunday on speaking to the mountains in our way that are distractions of what God has for us. Thanks for sharing.